With more than 13,000 holiday homes in England, Wales and Scotland, we chat to our fair share of guests looking for family days out and day trips with the kids within an hour of their cottage. Castles always come up. English castles provide the perfect tourist attraction combination: lots of outdoor space for energy release, spectacular views, interesting exhibitions and the odd treasure hunt or trail to keep the smaller ones occupied just a few minutes more. 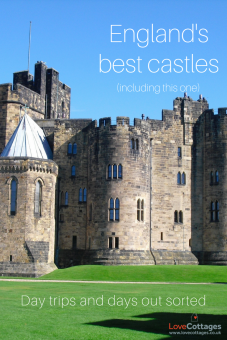 We can’t really say that this collection is a list of the best of English castles. There are so many and this is no catalogue. But we like them and we hope you do too! Built between the 12th and 15th centuries with Norman roots dating back to 1071, it is now largely ruined. Tutbury is most famous for the periods it was home to Mary, Queen of Scots while under house arrest following her defeat at the battle of Langside in 1568. Now a popular events venue, you’ll fill a few hours between what’s left of the towers and a courteous cream tea. Now in the hands of English Heritage, this is a tourist attraction of significant heights with an entry price tag to match and not far off the scale of activity available at nearby Warwick Castle, one of the best known English castles. With 900 years under its belt as a fortress, palace and attraction, it’s 1120 Norman keep is still largely intact. The remaining fragments of what was once a spectacular example of early medieval castle will do little to curb the imagination of bygone life. Surviving three sieges during the English Civil War but later dismantled, this ‘key to the north’ fortress is currently undergoing a £3.5M conservation project. You might even have seen Dave Myers of the Hairy Bikers helping with the refurbishment of the Arts & Crafts building into a visitor centre in his 2016 documentary. Dominant and iconic perched above the great white cliffs, Dover Castle’s role in Britain’s political history stems from the Iron Age to the mid 20th century. As such, it’s well cared for and there’s plenty to fill a day. Quite the historical tour, can you identify all the events it’s been important to in Britain’s tumultuous past? A place of myth and legend, Tintagel’s magnificent feat of cliff edge construction is only part of the wow factor. This is Cornwall’s claim to the legend of King Arthur. Tintagel is said (although largely unfounded) to have been where King Arthur was conceived. Since the 12th century the marketing has stuck and both the physical and mythical drama of Tintagel continues to draw the Cornish crowds. Confused by Leeds being in Kent? So are we, but the original manor built in the 800s was known as Esledes in olde English. Since then it has defended our borders, been home to a long list of royals, including Henry VIII and Catherine of Aragon, and attracted both high society and queues of tourists. Current exhibitions include an immersion in the Battle of Britain and the rather quirky Dog Collar Museum – yes, really. Probably one of the most photographed castles in England, this moated 14th century castle looks well preserved from the outside, although it’s interiors are mostly ruined. But that all adds to its character and charm. Pack your imagination with your picnic and your camera, but leave room for a National Trust afternoon tea! Self-proclaimed as ‘the king of castles’, unearth myths and legends galore through the storytelling of this reincarnated castle. From its Anglo Saxon roots to its present day purpose as an upper class family home of epic proportions, there are ghost stories and bloody tales to entertain you all. And to muster the excitement there’s a downloadable activity pack online for the kids. Now the saying goes that an Englishman’s home is his castle, well now it can be with a stay in Neville Tower at Bamburgh Castle. This once grand fortress stood between all and the south of Purbeck where Purbeck marble was once quarried. With connections to the murder of King Edward in 979 and his successor, Ethelred the Unready, the ruins we see today were first built by William the Conqueror (or his men) in the 11th century. The fate of the castle came during the English Civil War after enduring siege after siege yet it remained in the Bankes family ownership until 1982. Your National Trust membership card will see you in unquestioned these days. If you’ve ‘done’ Bodiam visit Herstmonceux for another moated English castle fix, but with a European twist. Once the largest private home in England, it was unique in its time for being built of brick (très French, apparently). Then in the 1440s a request was submitted to the king that the house be fortified, making it a castle. Today, the gardens and grounds are open to the public providing angle after angle for castle selfies in 300 acres of woodland and formal gardens. Guided tours are subject to availability. This is the seat of the Duke of Northumberland, whose kids are chummy with Kate and Wills, so who knows who you might see while visiting. But look out for witches and wizards too. Hollywood really put this place on the map in recent times and of all things, you can have a go at broomstick training while you’re here. One of Britain’s most iconic castles, Harry Potter references aside, you’ll have a great day out. If it is magnificence and regal splendour you’re after then you need to visit Windsor Castle – quite possibly the epitome of English castles. The State Apartments present a spectacle of royal history and style, wealth and power. 900 years of history including the well documented and now visible renovations following the 1992 fire in Her Majesty’s annus horribilis, make for a fascinating tour. When it comes to castles in England, the name clearly means a lot, status wise, but it isn’t always accurately applied. When hunting for school holiday activities with the kids, don’t be fooled into thinking all places with castle in their title are exactly that. Highclere Castle, for example, is definitely not a castle, but a stately home. And if you need to verify that, we’ve just given you another excuse to watch Downton Abbey re-runs. 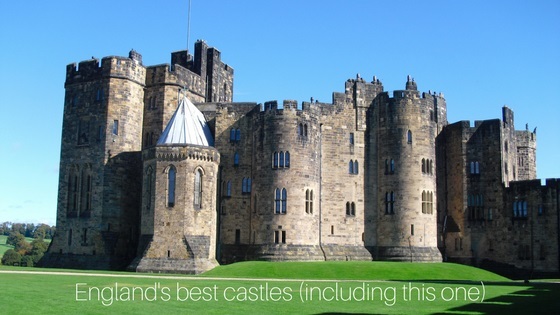 Will this list of English castles keep you busy for a little while? If you need somewhere to rest your head, why not stay in a castle too. Until next time, when we’ll be talking Welsh castles and Scottish castles too.